Dainty Doll by Nicola Roberts (Girls Aloud) is a brand that creates cosmetics to enhance pale skin tones. As I struggle to find foundation pale enough for my skin, I've often thought about buying something from this range. Yesterday in Boots I noticed they had a third off the price of Dainty Doll cosmetics so I decided to take the plunge and purchase the Liquid Foundation. There were four shades and I chose the lightest - Very Light 001. I'm thinking this looks slightly too light but the Light shade looked a bit yellow. If it's too light I can always add a drop of slightly too dark foundation to make the perfect colour! I ended up picking up some other Dainty Doll bits since they were on offer! I went for the Concealer in the shade 001 Abracadabra. It's a creamy concealer in compact form that's suitable for covering dark circles as well as blemishes. My final Dainty Doll item is an eyeshadow in the shade 002 Treat Her Like A Lady. It's a natural taupe shade that I'll wear for work. I have to say, I was rather tempted by the blushers and lipsticks too! 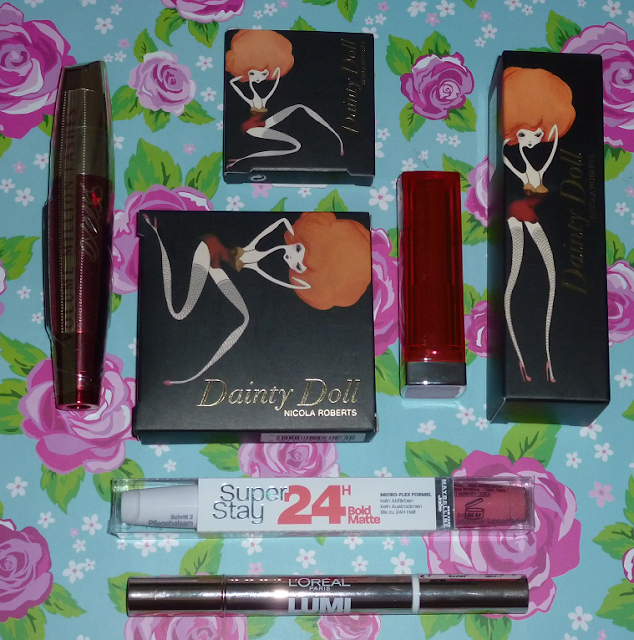 Here is a link to the Dainty Doll products on the Boots website if you're looking to pick some products up while they are on offer! My next purchase was from the Maybelline Color Sensational Vivids collection. I've seen these on a few blogs and when I saw them in store I knew I had to buy one! 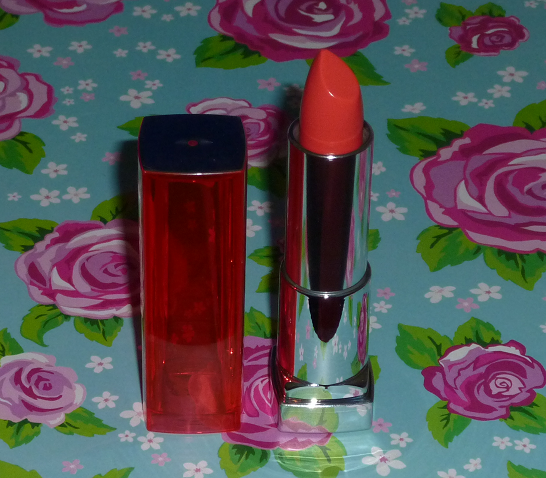 I could only see three shades so I chose my favourite which was 910 Shocking Coral. I'm very impressed with the super pigmented formula and beautiful colour. 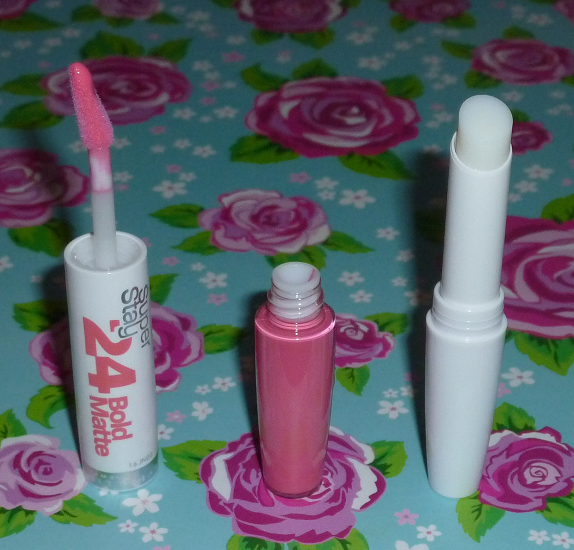 It was buy one get one half price on selected Maybelline Cosmetics and I saw a lip product I hadn't seen before - Super Stay 24 Hour Bold Matte. It's a dual ended lip product containing a fab matte liquid lip colour and a conditioning balm to be applied on top. I bought the shade 810 Peach Cocktail, a gorgeous pinky peach colour. 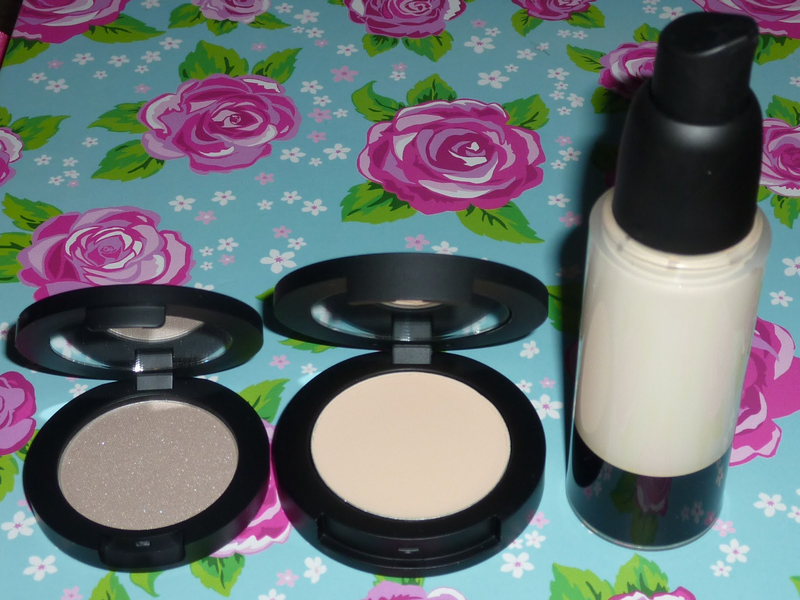 My final purchases were much loved products that I found last year and had to repurchase. I've spoken about the L'Oreal Volume Million Lashes Excess mascara a lot recently and I have a full review here so I won't go on about it apart from to say I LOVE IT! The Lumi Magique concealer does a great job at making my dark under eye circles a lot less noticeable and I got both of these products for £15 as Boots had an offer on selected L'Oreal products. I'll hopefully be writing more in depth blog posts on these items so let me know if there's anything in particular you want me to review. Have you tried any of these products? Let me know what you've been buying lately or for those of you who are doing brilliantly on your spending bans - what goodies have you rediscovered from your stash? Some great picks Suzy, I've never thought to have a look at Dainty Doll as I'd always assumed it was for EXTREMELY pale skin, a bit silly though as even so, I'm sure they've got some lovely lipsticks etc. I love the Maybelline Superstay thingies, they last forever! When I bought my first one, of course I never expected it to actually stay put for long, as so many products like this promise the earth and can't deliver. But this really does stay on all day, and is still there in the morning if I don't scrub it off before bed - not quite 24hrs, and it's by no means perfect by then, but I don't need to reapply all day. Will be interested to hear your thoughts though as I know at least one person who didn't like them. Aww thanks Mel :) Yeah they have some really nice shades of lippies, blushers and eyeshadows.